Love America? You’re The Target. It shouldn’t be very hard to understand what is happening in America. Mass confusion and rhetoric from all sides has left many disgusted and frustrated, so much to the point, it’s easier to shut it off, and tune it out. But, if there is one thing you must..MUST understand, is among the chaos and commotion, is a parallel society being formed by a faction of organizations and individuals under the guise of a religion. While Muslims across the globe are killing and maiming innocent people, Muslims in America don’t need violence, because we are handing our society to them on a silver platter. What’s even more confusing, by design of course, is who else is in this battle. Groups like Antifa (Anti-Fascists) Black Lives Matter, and yes , Communist groups are banding together, protecting who they have defined as “marginalized”. Muslims love the fact they have these groups covering for them. Have you seen any Islamists involved in these skirmishes? Probably not since they are “peaceful”. Let the dirty, misfits of society do it for them. The global caliphate is underway, and yes America, we are in the grip of it’s dirty hands. While the climate in America is rife with hatred and division from leftists, Socialists and Communists, Islamists have promised peace, love and unity, so of course many are drawn to their ideology. Islamists are being embraced and accepted as they forge ahead with their agenda, which is the replacement of society with theirs. An entire document is dedicated to this offense, laying out its goal methodically and meticulously. It’s titled: An Explanatory Memorandum on the General Strategic Goal for the Group in North America. This document was found during a raid conducted by the FBI in preparation for a federal trial against members of the terrorist group Hamas and the Muslim Brotherhood. The contents of this document was accepted as evidence into that trial, known as the Holy Land Foundation. Let this sink in..”destroying the Western civilization from within”. Their foundation has been being laid for years, but was accelerated during the Obama presidency, as he allowed terrorist organizations to settle in America, and even legitimized them. While portraying themselves as pious, tolerant victims, they share the same goal, which to them is a religious obligation. They believe, and promote, Islam is superior, and the world, especially the West, will benefit from becoming an Islamic state. So why aren’t they easily recognized as the enemy? Because they are adherents to a “religion”, and no one wants to believe a religion is sinister or deceptive. 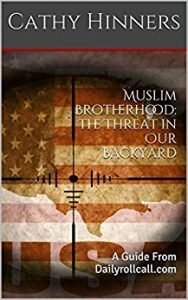 After 9/11, when 19 Muslims killed over 3000 innocent Americans, Muslims in America faced a backlash which was a set back to their goal of being viewed as peaceful. The only way they could recover was to become victims. Everyone loves a victim, right? Today, as they have advanced their victimhood, they are embraced and surrounded by those who believe we must accept and tolerate their beliefs, and those who do not, are labeled those dreadful words: Islamophobe, bigot and hater. No one wants to be labeled, as it can cost you your job, your family and friends, thereby creating a vast number of Americans who have succumbed to the enemy. Labels are the new way to get everyday Americans concerned about supporting anything conservative, or contrary to what the left believes. Not only are we now bigots and hater..add nazi, fascist, white supremacist and nationalist. If you support the basic values of America, the Constitution, or the President of the Untied States, you have a target on your back. Everyone of these leftist groups has a mirror agenda, to alter the society, we know as America. An entire new generation is present in our country, and they want Americans gone. They want suppression of a culture built on Christian and Judaeo values. They hate our police and military. They have fallen in line with the Islamic way of life, where everyone is equal, one government and one law. These are the Lefts heroes. No longer are they portrayed as the violent, lawless animals of society, they are now on a pedestal. All because they hate America as much as Islamists, Communists, Socialists and every other ist. Wake up America, just because we won the presidency, do not think for one minute we are in control. We are at war, and until we admit it, and act, we will be labeled and silenced. Next → Next post: Muslims Using Houston Crisis to Spread Islam.